The Insurance Institute for Highway Safety's (IIHS) passenger-side small overlap test measures how well a vehicle performs when just the front corner of the vehicle strikes another vehicle or an object, such as a tree or utility pole. IIHS has rated vehicles in driver-side small overlap crashes since 2012 and has noted vast safety improvements in this area in the years since. The organization launched the same test for the passenger side last year. "Although some vehicles in this group offer very good protection, in other models, the airbags, safety belts and structure showed serious deficiencies," said David Zuby, IIHS' chief research officer. "In those SUVs, a front-seat passenger would be at risk of injuries to the head, hip or leg in a right-side small overlap front crash." 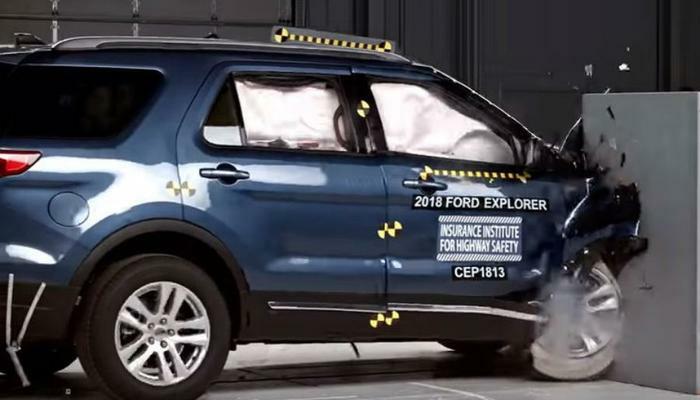 IIHS said the Ford Explorer earned a “poor” rating because the crash “seriously compromised” the vehicle's structure. Tests shows that intrusion reached 15 inches at the lower door hinge pillar and 13 inches at the upper door hinge pillar and the dashboard. Following the test, the door sill was moved in six inches toward the crash dummy. Post-crash measures showed a passenger had a high likelihood of suffering injuries to the head and right hip. IIHS says the Ford also showed poor structural performance on the driver side tests. It said the automaker is redesigning the Explorer and new models will have improved structural integrity on both the driver and passenger sides. As for the Jeep Grand Cherokee, the passenger-side test revealed a maximum intrusion of 10 inches at the lower door hinge pillar. More alarming, the group said, was the impact to the passenger dummy's head. The impact caused it to hit the dashboard hard through the front airbag and then, because the side curtain airbag didn’t deploy and the door opened, it moved outside the vehicle during rebound. “Measures from the dummy indicated that right leg injuries would be likely in a crash of this severity, and a head injury would be possible,” IIHS concluded. The organization expressed some concern about possible head injuries to a passenger in the Honda Pilot, but overall, the vehicle had good structural performance. The GMC Acadia, Kia Sorento, and Volkswagen Atlas all earned “good” ratings. IIHS said the Acadia had maximum intrusion of just two inches on the right side of the toepan. The tested vehicles were all 2018 models, except for the Sorento, which IIHS said had been redesigned for 2019 to improve safety performance in both driver and passenger impact tests.